Julius Commodore Loftin was the second child born to Adolphus Pinkney Gamewell Loftin (b. 10 Apr 1859, d. Abt. 1888) and Rebecca Marvina Drum (b. 07 Jul 1860, d. 26 Sep 1918). Julius was born 30 Nov 1881 in the Little Mountain area of Catawba County, NC. Records indicate that Adolphus and Rebecca had at least five children after they were married on 17 Apr 1879. Julius married Vertie Alice Hefner on 28 Jun 1903 in Conover, Catawba County, NC. Vertie was born 30 Jan 1881 in Conover, Catawba County, NC. She was the daughter of Lewis Hefner and Mary Melinda Deal. Julius and Vertie had at least six children. 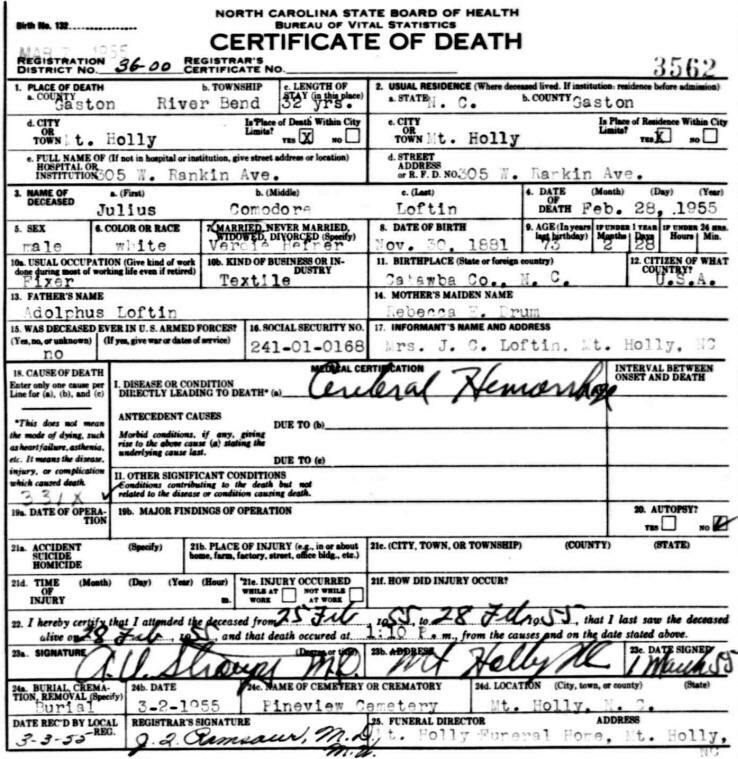 Julius died 28 Feb 1955 in Mt. Holly, NC, at the age of 73. The Death Certificate lists the cause of death as a "Cereberal Hemorrhage". It further lists his date of birth as "Nov. 30, 1881" in "Catawba Co., NC". His wife is listed as "Verdie Hefner", his father as "Adolphus Loftin", and his mother as "Rebecca Drum". Vertie was the informant. His occupation was listed as a "fixer" in a "Textile" company.